Lil Wayne is a free man but before the otherwordly MC returns to the studio to get back to recording, he’s traveling across the country to attend to legal obligations and family reunions. Lil Wayne arrived in Yuma, Arizona, on Friday afternoon (November 5) to finalize his probation stemming from another case, and he’s expected to show up at Drake’s Las Vegas tour finale on Saturday before his official homecoming party in Miami on Sunday. But before he returns to the limelight, Wayne was heading back to his hometown: Hollygrove, New Orleans. 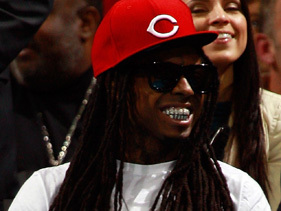 According to Young Money’s Mack Maine, he and Wayne, along with others, had plans to attend Friday’s New Orleans Hornets hoops game against the Miami Heat. “We about to go to the Heat game, they playing the Hornets,” Mack told MTV News on Friday. “[Hornets Guard Chris Paul] provided us courtside tickets. We just celebrating life, just trying to pick up where we left off from. We’ll hit the studio soon, we got the party Sunday, [but] right now, this is where it all started. The rapper was later photographed at the game, seated next to Maine, manager Cortez Bryant and label head Bryan “Baby” Williams. He sported dark sunglasses, a white T-shirt and a red fitted cap. The tightly contested game went down to the wire and The Times-Picayune snapped Wayne eagerly holding his hair wrapped beneath his chin as he watched his hometown Hornets defeat LeBron James and company, 96-93. The superstar lyricist does not have any formal plans while he’s in town. He’s expected to reconnect with hometown friends and family, according to Mack Maine. “I’m pretty sure the city has been waiting to see him,” he said, flanked by Kangol Slim and Mista Meana of New Orleans act Partners-N-Crime. MTV reported this article. MTV News has crews on the ground at all possible locations, so we’ll be sure to update you on Wayne’s latest moves.